Porcelain advertising thermometers are highly sought after and always on demand with collectors. Nowadays we have smart phones that can easily tell us the temperature. 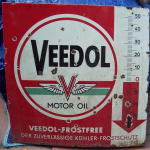 It wasn’t as easy in the 50’s and 60’s which is why many companies, along with creating advertising signs, made advertising thermometers. They knew that people, when stopping to acquire the temperature, would also look upon their advertised product. It was a great business proposition, not one that would work in today’s industry. It’s a sad fact that these thermometers will never see an industrial use again. Their beauty is sometimes beyond words which make these porcelain thermometers very collectible.